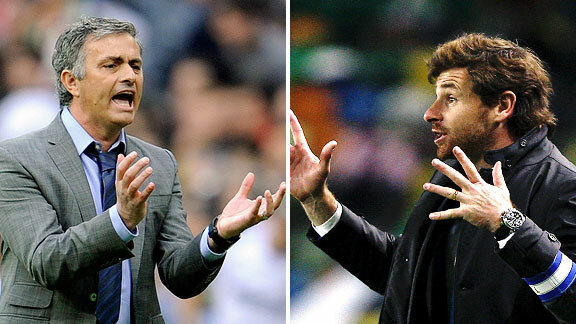 Is Villas Boas the next Special One? Getty Images Two of a kind: Jose Mourinho stirs the pot wherever he goes, and now Porto's Andre Villas Boas is being called the new Special One. They say he's the new Jose Mourinho. On Sunday night, Andre Villas Boas took the link a little further. It wasn't just that he was winning a trophy, it was the way he did it. Porto sealed the Portuguese league title with a 2-1 win away from home at fierce rival Benfica, despite playing the final 20 minutes with 10 men. Just under a year ago, Mourinho managed to hold out against Barcelona to record a famous victory at Camp Nou after his Inter side had a man dismissed. After the game, Mourinho rushed onto the pitch to start the celebrations with his players, who gathered in front of the small corner of Inter fans, tucked high away in the stands. Barcelona wasn't too happy with Inter's celebrations and, rather unsportingly, turned on the pitch sprinklers to disrupt the party. On Sunday night, Benfica pulled the same trick on Villas Boas and his players as they celebrated their title victory. In fact, they went one step further -- in addition to the sprinklers being used, they switched off the stadium lights, leaving Porto to jump around and dive across the pitch in near-darkness. And this is supposed to be the Estadio da Luz -- the Stadium of Light. Francisco Leong/AFP/Getty Images Porto's players celebrate their league-winning victory over Benfica before the lights went out. There's more to all this than sprinklers, though. By winning the title at reigning champion Benfica, Villas Boas showed the has that ability to get up people's noses, to win trophies in the most symbolic way. Mourinho won his second Premier League title by thrashing second-place Manchester United 3-0; he won last year's Coppa Italia at the home of Inter's opposition in the final, Roma; and he won his second European Cup at the home of Real Madrid, the club he was about to join. The similarities are clear -- like Mourinho, Villas Boas is young, Portuguese, had no professional playing career to speak of, and is making his name at Porto. He is effectively Mourinho's protégé, having worked under him at Porto, Chelsea and Inter. Villas Boas is slightly less confrontational, but no less confident in his ability, and no less likely to stoke a fire and wind up his opponents. "We showed who plays the best football," he told the press after Porto clinched the title. "This was constantly ignored on a daily basis by everyone, so our cry of revolt against that helped us -- with merit due to the players -- to win the title." The mention of the players came almost as an afterthought. It recalls Claude Makelele's criticism of Mourinho ("He forgot about the players and he just took all the credit for himself"), if not as extreme. And that sums Villas Boas up well -- like Mourinho, but not as extreme. Villas Boas also frequently referred to the "injustice" of last season, when Porto's star striker Hulk was banned for 17 games after a tunnel fight against Benfica in December 2009. Most believe that Benfica would have won the title anyway and, after all, this was before Villas Boas joined the club, so it really shouldn't concern him. But it has helped foster that us-against-the-world mentality that Mourinho has used so frequently, whether it be complaining about referees, fixture lists or the attitude of other managers. Villas Boas is a keen tactician. His primary job under Mourinho involved pre-match scouting and compiling amazingly detailed notes on Chelsea's upcoming opponents. However, he has had great confidence and belief in his own strategy throughout this season, sticking to a 4-3-3 system throughout, and often simply overpowering sides. In that respect, there's a similarity to the Chelsea side Carlo Ancelotti assembled last season, which was based around strength and power and based on an intent to ruthlessly dismantle opponents, rather than break them down with finesse, as Benfica is more likely to do. The formation owes much to Villas Boas' predecessor, Jesualdo Ferreira, who was also a 4-3-3 man. That continuity extends to the players used, though there are two notable exceptions. Villas Boas was happy to sell previous captain Bruno Alves to Zenit St Petersburg, and practically pushed another big name, Raul Meireles, out the door, signing Sporting's Joao Moutinho instead. These deals were not necessarily about balance and cohesion in the squad, but about marking a new era at the club, in the dressing room and on the training field. Again, note the similarities to Mourinho's arrival at Real Madrid, where the two longest-serving players, Raul and Guti, were both told that it was time to leave. Porto's main threat is up front, where the amazingly powerful Hulk starts from the right, cutting in and charging at goal. His strength is complemented by the skill and trickery of Silvestre Varela on the other flank, who stays wider and stretches the play, providing plenty of assists for Falcao, a fine finisher. The midfield is based around the strong Brazilian Fernando, who was excellent in the game against Benfica. He is assisted by Moutinho, a clever passer who has rediscovered his best football since his controversial transfer, and Fernando Belluschi, more of an attack-minded player who storms forward and links up with Hulk down the right. The defense is unremarkable in terms of personnel, but is always very well-drilled, despite occasional rotation at center back. Against weaker sides, it often appears that Porto defends with only five players when it loses the ball -- with Fernando ahead of the back four -- but against stronger opponents, the wide players tuck in and create a solid 4-1-4-1 system in the defensive phase of play. The extraordinary form Porto has showed this season makes it a real shame it wasn't in the Champions League, as it's been difficult to gauge quite how good this team really is. It hasn't lost a league game in 2010-11, and could become only the second team in Portugal to go a whole season unbeaten. Perhaps this could be the start of Villas Boas' equivalent to Mourinho's recently ended 150-game unbeaten run. It's likely Villas Boas will have a different home for next season, however. With big clubs taking notice of his achievements and various presidents in search of a new manager this summer, it seems improbable we'll get to see Villas Boas in the Champions League with Porto. Wherever he goes, expect fireworks -- followed, most likely, by sprinklers.